You wince at the pain. You cry at the ache. You tremble at the torture. No, you are not pregnant (thank goodness guys!) but you are suffering from kidney stones. Did you know that women report kidney stone pain to be more torturous than childbirth? Can you say, "OUCH?" But you are suffering for NO reason! And almost one in every 20 people will develop a kidney stone sometime in their life. And if the pain is not the worst part, you can actually be part of the millions who spend thousands of dollars on hospital visits, various treatments, harsh side-effect medication and surgery. And the best or worst news (depending if you have spent the thousands of dollars on kidney stone treatment or not), you can treat kidney stones naturally with a simple home remedy for kidney stones. In fact, the body can naturally pass your stones with no medication, no surgery and not using 2 months of your salary. If you are a kidney stone sufferer, here are 10 remedies that could be the difference between misery and bliss. I hope your treatment starts in the next 2 minutes. 1. Water! 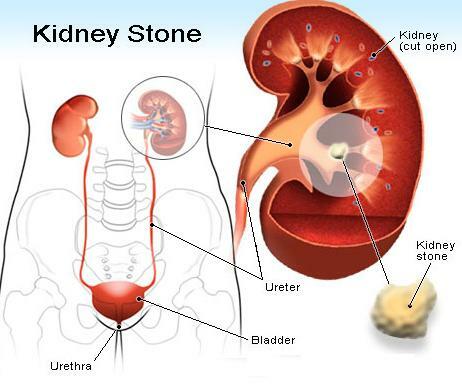 Typically, kidney stones are caused by dehydration (not getting enough water). If you live in an area with hot, humid weather or where clean water is rare, your odds of getting kidney stones are tripled. Therefore, you must begin your natural treatment with drinking at least 10 tall glasses of water a day. A good tip is to compete against a friend or spouse. Who can drink the most water? 3. Citric Acid! Did you know that lemons are potent with citric acid? And citric acids and lemons have been known to dissolve hard materials, even stones. Add a lemon to your drinking water to spruce things up. 4. Play again! Get outside or in the gym and do a little exercise. There are thousands of reasons to exercise but besides feeling better about yourself, you can actually give your body a boast of overall health. And overall health includes flushing the kidneys. 5. Cranberry juice from concentrate! By drinking cranberry juice, you can maintain your urinary tract which will help prevent kidney stone formation. 6. Citrates! Citrates reduce the build up of uric acid and eliminate the build-up of calcium salts which cause the formation of kidney stones. To get an adequate amount of citrates, drink plenty of fruit and vegetable juices such as carrot, grape and orange juices. 7. Drink Soda! If you drink at least 10 glasses of water a day, then a daily soft drink could possibly prevent future kidney stones by dissolving the stones. A recent study proved this theory and a natural cure working in 2 hours will pass kidney stones in less than one day. Discover more at our website. 8. Sugar! High sugar intake is associated with increased risk of kidney stones. You can cut hundreds of calories and prevent future kidney stones by staying away from sugary drinks and foods. 9. Flush! No, not your toilet! But you need to flush your liver, kidney and gallbladder with a simple water-soluble fiber vegetable that has been labeled a miracle by my customers. 10. Believe! I know it sounds corny but you need to believe in yourself! We preach it to our kids but it is time you practice what you preach. If you are serous about treatment, start today! You might be thinking yourself, "These remedies seem too simple?" And they are but they are the beginning of an effective treatment because your miraculous body wants to heal itself. And these simple tips are the beginning of what your body needs. I believe a wise sage said, "Prevention is always the best remedy." And he was right! If you know the pain associated with kidney stones, you will know that lifestyle changes need to take place immediately. And if you are serious about dissolving and flushing them. oh my god! seriously, soda!? hmm i've suffered from them last year.